The case of Albrecht Durer’s engraving, known as Melancholia I has left many scholars ultimately confounded. This article doesn’t pretend to answer all questions surrouding this work of art. However to the best of my knowledge nobody has actually looked at the humours of Durer and Ficino from a Traditional astrological perspective. That is to say that the humours are discerned by astrological delineation. The question of what they actually meant by the Divino Fuore and how it relates to melancholia is complex. The dictionary definition of Melancholy is fairly straightforward. Melancholia (from Greek μελαγχολία – melancholia, “sadness”, literally black bile),[See Lidell & Scott’s Greek- English Dictionary in the Files section] also lugubriousness, from the Latin lugere, to mourn; moroseness, from the Latin morosus, self-willed, fastidious habit; wistfulness, from old English wist: intent, or saturnine. secondly ,in contemporary usage, is a mood disorder of non-specific depression, characterized by low levels of both enthusiasm and eagerness for activity. We know of Durer’s relationship with Marsilio Ficino and have ample evidence he was familiar with the ideas found in Three Books of Life. He was also familiar with the work of Cornelius Agrippa. Ficino complains of, and lists remedies for, what he refers to as scholarly melancholy: a leaden preponderance brought on by an excess of black bile. The gravitas required of great scholars, artists and intellectual therefore comes at a price. The remedies are either Solar or Jupiterian, so we have a number of choices ranging from amethyst to aloe and the company of fair women. 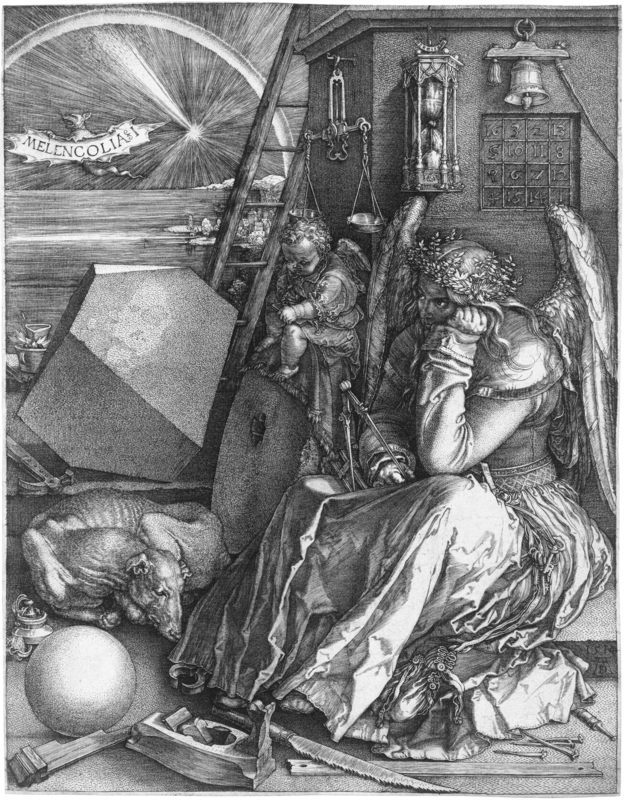 Albrecht Durer’s Melancholy angel is something of a sphinx and has resisted definitive explanation for several decades. It’s claimed by many scholars that the work is a self-portrait of the artist.. The idle tools, symbolic repesentations of the Liberal Arts, the bat, the oppressive lifelessness is dramatically contrasted by the angel’s eyes that seem to imply a kind of frenzy coming out of the darkness. Melancholia I depicts the intellectual situation of the inspired artist and is thus, by extension, a spiritual self-portrait of Dürer. In medieval philosophy, everyone was considered to be dominated by one of the four humors. In practise however, there is usually a combination. Melancholy is associated with black gall, was the least desirable of the four, and melancholics were considered most likely to succumb to insanity. Renaissance thought, however, also linked melancholy with creative genius; thus, at the same time that this idea changed the status of this humor, it made the self-conscious artist aware of the terrible risks that came with his gift. The theory of the Humours is at least as old as Hippocrates and developed by Galen. The humours were at the core of medicine and indeed the understanding of why people are they way they are prior to the Elighhtenment. Chaucer introces charcaters as being of a particular humour as an indication of personality. The Humours also had Universal significance because they were the children of the four elements. Durer created many self portraits of himself, and in more than one he is appears in the traditional likeness of Christ. In tradition, the Magus bringing gold to Jesus was an old, grey haired man named Melchior. 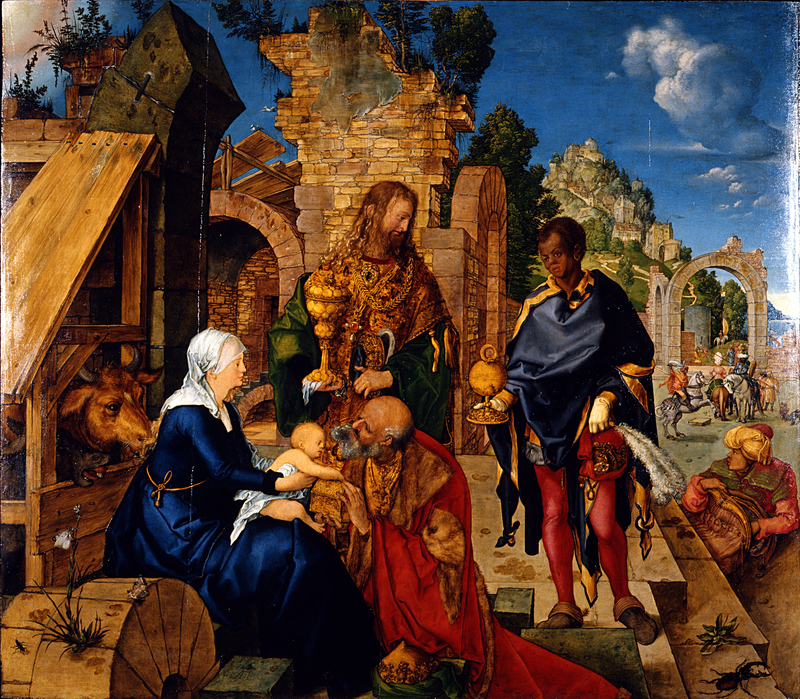 In Durer’s Adoration of the Magi we find the artist looking resplendent, first in line with the gift of gold. Gold was the most important antidote to the destructive form of melancholy according to Ficino. He gave it Jupiterean as well as Solar significance. It’s no coincidence that Duere has painted himself in this way. When comparing this to the other self portraits, the resemblance is striking.What we know of the Melancholic humour from classical points of view are the qualities of cold and dry and of being the heaviest element, Earth. There is no obvious reason from a classical point of view why the humour would take on this singular role as bringing on a divine frenzy or melancholy madness. – a madness so powerful it could destroy its human vessel or raise him to the level of demiurge. If we refer to Durer’s chart it will readily be seen that it is not Melancholic in the classical sense at all. It is decidedly Sanguine. If we are looking for an oppressive Saturnine presence in the chart, it is not to be found in any extraordinary degree. Here we have an otherwise unafflicted Saturn under the beams. Mercury is parallel Aldebaran and conjunct Algol. Saturn is also conjunct Aldebaran. The meaning of Algol is The Ghoul, the demon and beheadings. Aldebaran is associated with blindness as well as being the eye of God. Saturn is in the Decanate of Jupiter, Term of Mercury and in favourable Sect. remarkably developed intellect, but not a melancholic. in the classical sense. We have some choices to make. We can claim that Durer is merely posing, garnering key ideas from thinkers such as Ficino and expressing them artistically… or that he was a megalomaniac who couldn’t stop painting himself. However, it is most likely that Durer and Ficino are pointing to something else altogether. I would however suggest there is a grain of truth in all three assumptions. What is increasingly apparent is that the the Melancholic state of the artist or scholar is not identical as the element itself. When we turn to Ficno’s chart the first thing most will notice is that Saturn is sitting right on the Ascendant. It’s a partile conjunction. Saturn is however dignified The Moon is in an applying Trine to Venus. The Sun is in a loose but applying square to Saturn. The Sun and Mercury in the Ninth House bestows a deep and religious focus. Mercury is direct and clear of the beams. Both Saturn and Jupiter are in Hayz. The chart Alumuten is Mars. The Hour of the Nativity is Saturn. Jupiter is Lord of the Tenth and Eleventh House. When we delineate the chart, we find the Humour is Sanguine, a light humour with none of the characteristics of Melancholy. Melancholy is about 15% and Choleric one third.The charts shows the almost unprecedented support Ficino enjoyed in his writing of Theologia Platonica, his translations of Plato and the Hermetica. He was well taken care of by enormously wealthy Medicis and spent plenty of time sharing ideas with the greatest minds of his generation. [the melancholy humour] when it is stirred up, burns and stirs up a madness conducing to knowledge and divination, especially if it is helped by any celestial influx, particularly of Saturn … By melancholy saith [Aristotle], some men are made as it were divine, foretelling things to come, and some men are made poets. So it’s not a questioin of Humours in the classical sense, it is specifically Saturn and Agrippa leaves us with the strong impression that one can induce, by stirring it up. I’m reminded of Hermes or Mercury in Botticelli’s Primavera. He appears to be strirring the either with a wand. Given Botticelli’s close relationship to Ficino, this might offer some context. To add to this theme, there is the question of the magic square in Melancholia It has been called the Jupiter square because of the numerical values. The sum 34 can be found in the rows, columns, diagonals, each of the quadrants, the center four squares, and the corner squares (of the 4×4 as well as the four contained 3×3 grids). This sum can also be found in the four outer numbers clockwise from the corners (3+8+14+9) and likewise the four counter-clockwise. The more the engraving is studied, the more it becomes clear that the angel is not fettered in any way other than by the sheer weight of gravitas. Jupiter is regarded as the antidote to Saturn in Ficino’s system. I beelieve thre are levels of meaning in this work that may forever evade us, but the relationship between Melancholia and the kind of genius Plato discusses saturates its significance. This state of divine possession – the Dyonysian artist Intellectual as both man and god was not foreign to the Renaissance imagination. And this did in fact lift the status of poetry and music to heights hitherto unknown since Classical times. Music could embody divine qualities and have the effect raising the soul to a similar ecstatic union through sympathetic magic or resonance. Sympathetic magic is at the core of Ficino’s thinking. To look for a strongly Melancholic humour in the normal sense is to miss the point. Earth is Cold and Dry. To conjure heat near to the seat of the mind to induce inspiration from the same source is an act of remarkable chemistry – the work the Magi such as Pico speaks of in his Oration on the Dignity of Man. But in simple terms, this “black bile” of the Earthy Element is fuel for the wise. It’s not the element itself, it’s what’s done with it. Although not quite in the same context, there is some correlation between brilliance and what Winston Churchill refered to as “being in the jaws of the black dog.” When the humour overwhelms, quagmire ensues. But when turned to fuel, genius is unleashed. I leave Plotinus with the last word: In reference to the power of the stars, he suggests it lies in the human ability to perceive their patterns as analogy “the wise man is the man who in any one thing can read another” (Enneads II.3.7 trans. S. Mackenna).